Features a non-slip pressure lock for quick and easy set-up and a wide spread leg base which adds more stability. Made from strong aluminum alloy, it can be used with continuous light, strobe flash lights, and backgrounds. Height is adjustable from 86cm to 300cm / 32" to 118". 1/4" screw tip on the stem. Weather resistant vinyl case made to carry a tripod up to 36"/92cm long. 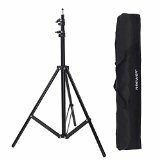 Neewer photography light stand with carrying bag kit. This six foot lightweight light stand is designed for location shooting and small studios. Made from aluminum alloy with a professional black satin finish, folds up quickly and easily. This weather resistant vinyl case was made to carry a tripod up to 36"/92cm long.